This Grand Banks Classic is presently owned by Francis Goddard, a renowned boat builder in the Chesapeak Bay area. This is a project boat that just could not the time to be worked on. The hull, which is in perfect condition, is #147 out of only 175 built, for this model. The twin Lehman diesels are great on Fuel and are in great shape as well. The work that needs to be done have to do with the interior only. I needs woodwork around the windows, walls need to be replaced, and the inside needs varnishing. The top cabins have been fiberglassed and are in good shape. 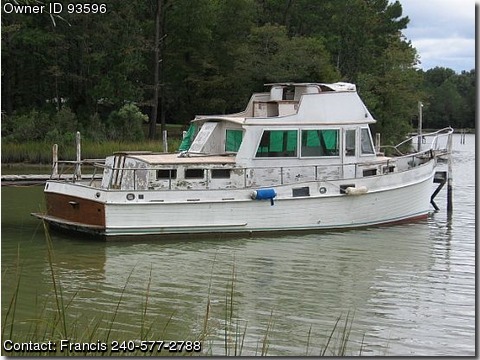 The layout of the boat has 2 bedrooms, baths, a full galley, including stove, oven and refrigerator. Comes wiht a Northen Lights generator in good shape and has a working heating and Air Conditioning system. Also included is a Stainless Steel fresh water tank. This is a lot of boat for relatively very little money. A good solid investment for the right person. Reasonable offers will be considered, and as always, price is negotiable.